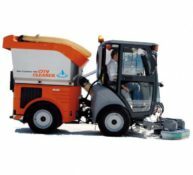 The Hako Citymaster 1200 has been tailor-made to meet the high demands placed on professional street and footpath cleaning. As an articulated compact sweeper it can be converted in 45 minutes to the most aggressive large capacity footpath scrubber on the market. It ensures thorough cleanliness, even where space is limited. The new scrubbing deck attachment (optional extra), scrubs and cleans floors, leaving them immediately dry to walk on. It is the ideal answer for those towns and cities wanting an efficient and high standard of cleanliness on their footpath, mall and plaza areas, multi-storey and underground car parks, or market squares to take hygiene and environmental cleaning to a new level. The Hako Citymaster 1200 city Cleaner is so versatile it can be changed to a sweeper, scrubber, mower, snow remover, snow gritter and more. The possibilities are endless. The Citymaster 1200 City Cleaner stands for uncompromising wet cleaning for town centre areas such as, for example, pedestrian zones, footpaths and cycle paths, underground car parks and market places. With a working width of 1,330 mm the Citymaster 1200 City Cleaner with articulated steering is in its element, both on larger spaces as well as in narrow, restricted town centre areas. The three suspended brushes adapt to every type of surface and the highest possible degree of cleanliness is achieved. With the optional chemical dosage, cleaning agents can be added to enhance the cleaning performance. A variable pressure adjustment, which can be controlled from the driver’s cab, can exert extra pressure on the brushes, depending upon the floor and layer of dirt. This is designed to improve the cleaning result even more. As a result of this combination, floor coverings can be completely revamped and they can shine in a totally new light. Furthermore the Citymaster 1200 City Cleaner can be used as a multi-functional machine and can, with the corresponding equipment, also be used, for example, for winter maintenance or grass care.